Religion • Landmark is being elevated to a loftier status in Provo. Kim Raff | The Salt Lake Tribune A construction worker helps to lay the foundation under the Provo City Center Temple at the construction site in Provo on Thursday April 18, 2013. The workers dug down nearly 40 feet and supported the building's structure on metal pylons to reconstruct the foundation. Kim Raff | The Salt Lake Tribune Construction workers lay the foundation under the Provo City Center Temple at the construction site in Provo on Thursday April 18, 2013. 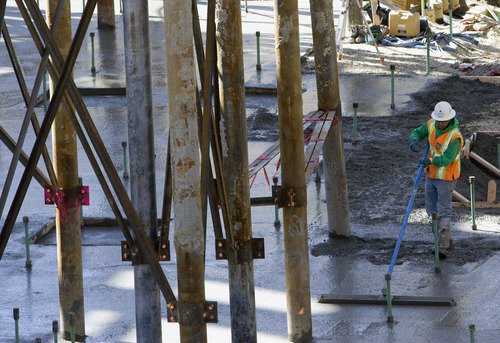 The workers dug down nearly 40 feet and supported the building's structure on metal pylons to reconstruct the foundation. Kim Raff | The Salt Lake Tribune Construction workers lay the foundation under the Provo City Center Temple at the construction site in Provo on Thursday April 18, 2013. 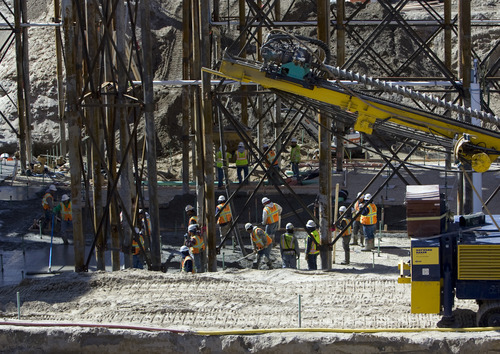 The workers dug down nearly 40 feet and supported the building's structure on metal pylons to reconstruct the foundation. 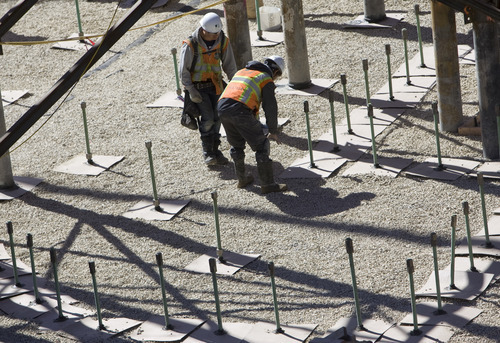 Kim Raff | The Salt Lake Tribune Construction workers lay the foundation under the Provo City Center Temple at the construction site in Provo on Thursday April 18, 2013. The workers dug down nearly 40 feet and supported the building's structure on metal pylons to reconstruct the foundation. Kim Raff | The Salt Lake Tribune A worker walks past a spire that will be used on the construction of the Provo City Center Temple at the construction site in Provo on Thursday. The temple is being rebuilt after a fire in 2010. Kim Raff | The Salt Lake Tribune A construction worker digs out foundation walls below the Provo City Center Temple at the construction site in Provo on Thursday April 18, 2013. 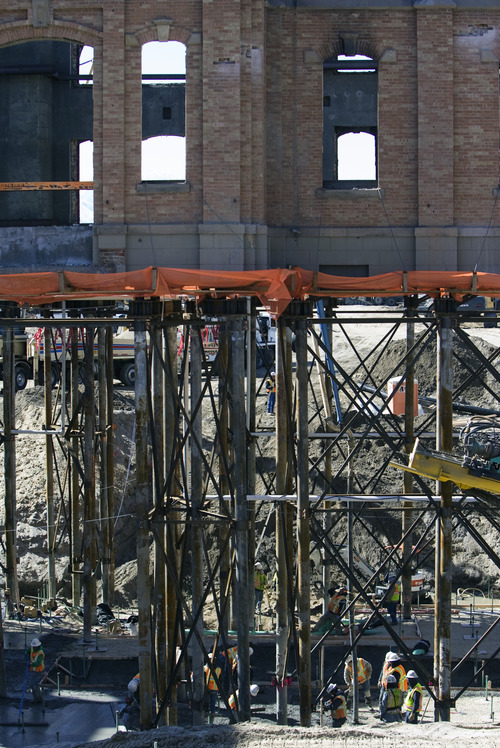 The workers dug down nearly 40 feet and supported the building's structure on metal pylons to reconstruct the foundation. Kim Raff | The Salt Lake Tribune Construction workers lay the foundation under the Provo City Center Temple at the construction site in Provo on Thursday April 18, 2013. 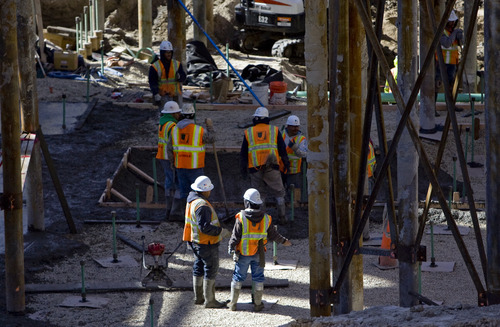 The workers dug down nearly 40 feet and supported the building's structure on metal pylons to reconstruct the foundation. Kim Raff | The Salt Lake Tribune Construction workers lay the foundation under the Provo City Center Temple at the construction site in Provo on Thursday April 18, 2013. The workers dug down nearly 40 feet and supported the building's structure on metal pylons to reconstruct the foundation. Kim Raff | The Salt Lake Tribune A construction worker watches as the foundation of the Provo City Center Temple is laid at the construction site in Provo on Thursday April 18, 2013. The workers dug down nearly 40 feet and supported the building's structure on metal pylons to reconstruct the foundation. 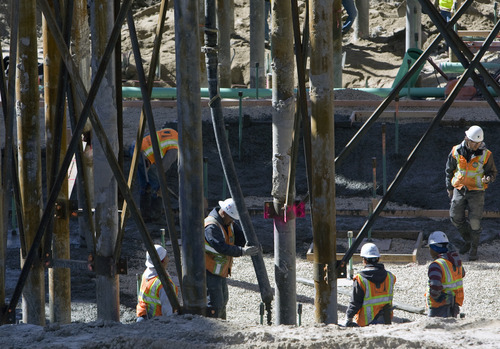 Kim Raff | The Salt Lake Tribune Construction workers lay the foundation under the Provo City Center Temple at the construction site in Provo on Thursday April 18, 2013. The workers dug down nearly 40 feet and supported the building's structure on metal pylons to reconstruct the foundation. Kim Raff | The Salt Lake Tribune A construction worker walks around the Provo City Center Temple construction site in Provo on April 18, 2013. The workers dug down nearly 40 feet under the temple and supported the building's structure on metal pylons to reconstruct the foundation. Provo • Forty feet below the walls of the Provo Tabernacle, workers are preparing the foundation for the Provo City Center Temple. 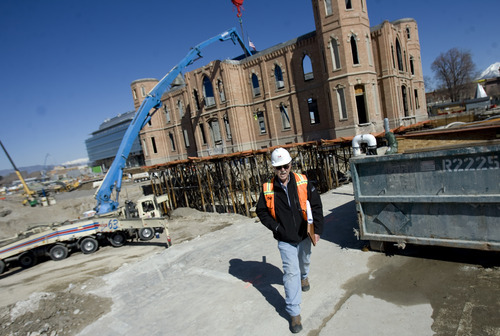 Representatives of The Church of Jesus Christ of Latter-day Saints gave journalists a close-up look Thursday at efforts to restore the tabernacle more than two years after a fire gutted the 129-year-old landmark. "For me, it is a beautiful symbol of rebirth," said Andy Kirby, the church&apos;s project manager for the Provo City Center Temple. Since the groundbreaking for the temple in May, crews have removed some bricks from the interior and installed concrete to stabilize the masonry walls. 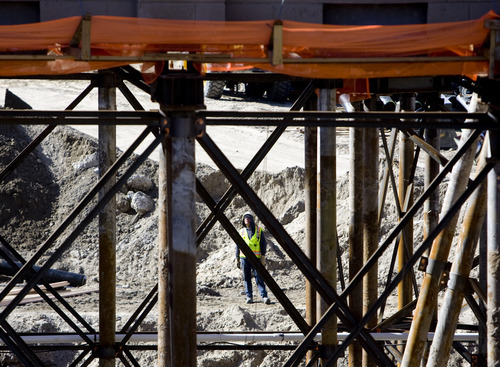 The steel girders, which swaddled the walls after the blaze, were removed, and 146 pilings were driven 90 feet into the ground around the building. Then, Kirby said, the original foundation was removed and replaced with steel beams as crews began digging out under the edifice. 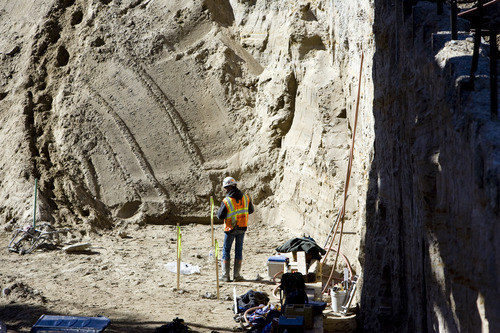 The result: a 6.8 million-pound building stands on stilts above a deep pit. Kirby said sensors and the pilings, as well as laser surveying equipment, ensure the building is not moving. On Thursday, crews were pouring concrete for the base of the new foundation. Eventually, foundation walls will rise between the pillars holding up the building. Kirby said the temple will have a two-story basement, with an additional one-story underground space for support structures, mechanical rooms and underground parking on either side of the temple. When finished, the temple grounds will stretch from Center Street to 200 South. Kirby would not say when the temple would be completed, but Elder William R. Walker, executive director of the LDS Church&apos;s Temple Department, told a regional conference in September that it would be done in 2015. When the temple opens, Provo will join South Jordan as the only cities in the world with two Mormon temples. Latter-day Saints see temples as houses of God, where they take part in their faith&apos;s highest sacraments, including eternal marriage. Kirby said the goal in Provo is not just restoration but also preservation. 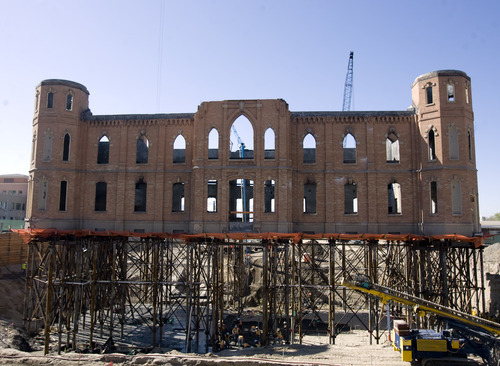 The Salt Lake City-based faith will preserve the tabernacle&apos;s exterior brick, using brick salvaged from the fire where possible to replace missing masonry. He said crews also saved some of the woodwork and will try to incorporate it into the temple. The church will install art-glass windows that resemble the original ones. "People familiar with the tabernacle," Kirby said, "will see parts of the tabernacle in the temple." Provo resident Melanie McCoard said she was "astounded" to see the work  and she isn&apos;t the only one. "I have been here on nice nights," McCoard said, "and there are people all around the site." Mayor John Curtis said the project not only preserves a cherished piece of Provo&apos;s history but also will bring more people downtown.